Sophomore goalkeeper, Giovanni "Gio" Canales, had a solid year in net for the Thunderbolt. He was among the state leaders in saves, finishing with 167. 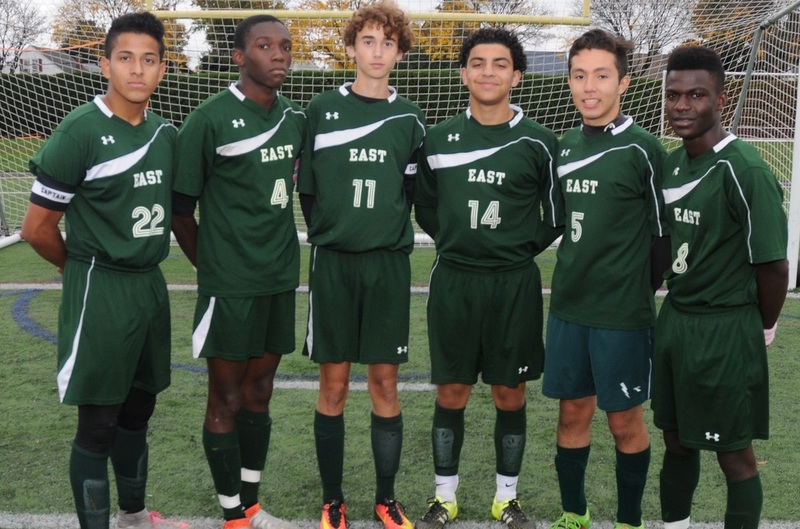 The Cranston East Boys' Soccer team opened up their 2016 season with a 0-0 tie against West Warwick in the annual Injury Fund game played at Cranston Stadium. Sophomore Goalkeeper, Giovanni Canales, earned the shutout in the 50 minute contest with eight saves. The 'Bolt, who graduated ten seniors from last year's team (10-3-3), will be one of the youngest teams to play on the pitch this season. Coach Grenier envisions another solid year with one of the youngest teams in Division III. 'Bolt earn tie against tough Patriots! 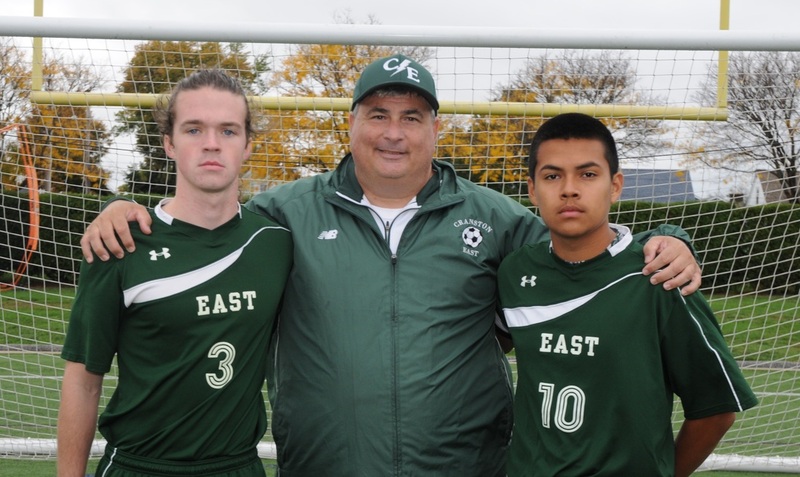 ​Over the past four years, the Cranston East Boys' Soccer team has developed a reputation of being a strong defensive team. In fact, they were the top defensive team in Division III last year, allowing just ten goals in league play. Although the Thunderbolt have replaced eight starters from last year's 10-3-3 team, they started their league year with a 0-0 tie with Pilgrim High School. The Patriots, who dropped down from Division II after missing the playoffs by one point, could manage only 12 shots on goal, seven of which were outside the 18. With the help of the strong play of defenders Carter Haid (sweeper), Ayo George, Adnel Lopez, Pedro Saravia and Luke Hogan, goalkeeper Giovanni "Gio" Canales picked up his second shutout of the year with six saves. During the last five minutes of the match, the 'Bolt had three chances to score the winning goal, however Pilgrim keeper, Sean Blanchard (six saves) and sweeper Matt Woods were instrumental in helping the Patriots hold of the green and white. 'Bolt drop tough one in the heat! ​PLaying in oppressive conditions, the Chieftans took full advantage of an extra day's rest and defeated the visiting Thunderbolt, 2-0, for their first win of the year. Ponaganset, who lost 2-1 to Davies on Tuesday, had two days of rest, while Cranston East, who played to a 0-0 tie on Wednesday against Pilgrim, were playing their second game in three days. Despite holding Ponaganset to only 4 of their 14 shots inside the 18, the 'Bolt could not stop the opportunistic chances that the Chieftans took full advantage of. At the 23:25 mark of the first half, junior Evan Hallberg lined a 40 yard shot which knuckled over the outstretched arms of Gio Canales. In the second half, the Thunderbolt outshot the Chieftans, 12-6, but could not finish on several opportunities. ​With under five minutes to play, the defense of Ponaganset was able to get it out of their defensive half against the full pressure of Cranston East. After receiving a free kick at the 25 yard line, Alex Blanchard took a shot which hit the top post and landed over the line for a 2-0 lead with 3:15 remaining in the match. Giovanni "Gio" Canales had another solid game for the 'Bolt by making eight saves. For the year, the sophomore has already made 14 saves in league play. 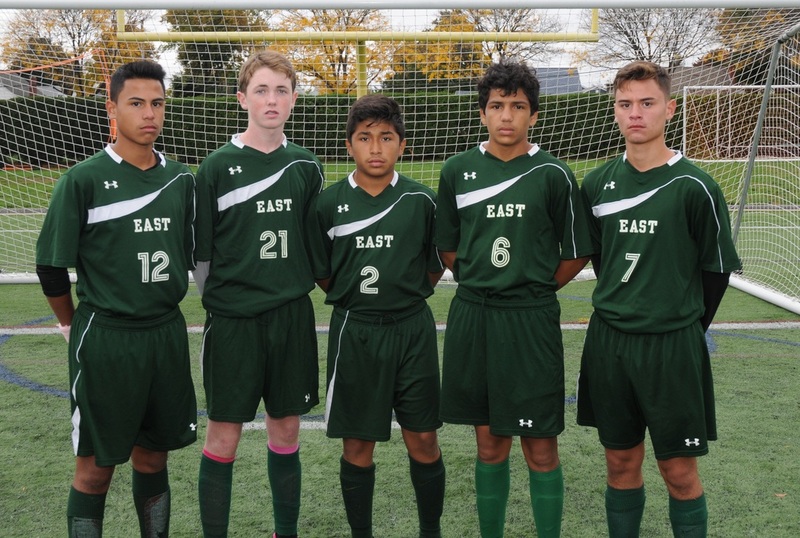 ​Cranston East, who has one of the youngest varsity rosters in the state (average age 15.7), look to win the first match of 2016 on Monday against Paul Cuffee at Cranston Stadium. East breaks out against Paul Cuffee! In his first year as a full-time varsity player, Nathaniel Hardy (11) has played well for the Thunderbolt! 'Bolt garner tie in closing minutes! Ayodeji "Ayo" George, Cranston East's Junior Co-Captain, scored on a corner kick late in the game to give the 'Bolt a 2-2 tie at PCD. After ending their scoreless streak against Paul Cuffee, the 'Bolt traveled to Providence Country Day to take on the 2014 Division III Champions. Out of the gate, Cranston East looked sharp by scoring their first goal of the year when Nathan Hardy sent a pass to Richmond Miamen down the left touchline. Miamen, then, made a perfect pass to Kerin Murillo, who gave the Green and White a 1-0 lead two minutes into the game. Although they controlled the field of play early, a lack of communication and two defensive lapses led to two easy goals for PCD for a 2-1 half-time lead. "We did not mark our men correctly on two free kicks and it resulted in two goals," said Richard Grenier Jr., Assistant Coach. In addition to a ten minute lapse on defense, the Thunderbolt missed three opportunities to score on breakaways in the first and second half. Despite that, junior tri-captain Ayo George made sure that the Green and White would leave with at least a point when he scored the tying goal with less than four minutes to go in the contest. At the 36:33 mark, Kerin Murillo sent a corner kick to back post where George headed the ball past the Knight goalkeeper. Giovanni Canales, who was stellar in net for East, recorded a season high 15 saves. Thunderbolt post shutout on the road! In only his freshman year, Kerin Murillo is the leading scorer for the 'Bolt this season. After eleven days off, the Cranston East boys' soccer team did not show any signs of rust in shutting out Rogers, 4-0, in Newport. Although they outshot the Vikings, 17-3 in the first half, the 'Bolt only held on to 1-0 lead courtesy of Richmond Miamen who took a pass that was sent from the right touchline into the box by Carlos Montt. ​In the second half, the 'Bolt continued to control the field of play by outshooting the Vikings 16-7. ​At the 18 minute mark, freshman Kerin Murillo set up fellow classmate Angel Lopez with a perfect pass to the right. Lopez beat the goalkeeper to his right for 2-0 lead. 11 minutes later, senior tri-captain, Carlos Montt, took control of the ball in the midfield and dribbled by two defenders before extending the East lead to 3-0. Murillo made it 4-0 (assisted by Nathaniel Hardy) with under 7 minutes to play. Giovanni Canales picked up his second league shutout of the year with six saves. ​'Bolt turn back rebuilding Spartans! Cranston East improved their record to 3-1-2 on the year with a 5-0 victory over the rebuilding Spartans of 'Scituate. East, who also has one of the youngest rosters in the state, out-shot the blue and white, 30-2. East comes from behind to tie Pride! ​​On Monday, the Cranston East Thunderbolts came from behind to settle for a 2-2 tie against RIIL newcomer, Blackstone Valley Prep - Mayoral Academy. Unfortunately for the Green and White, they came out flat against an inspired "Pride" eleven who scored two goals in the game's first ten minutes. Despite their sluggish start, East was able to outshoot their opponents, 20-9. 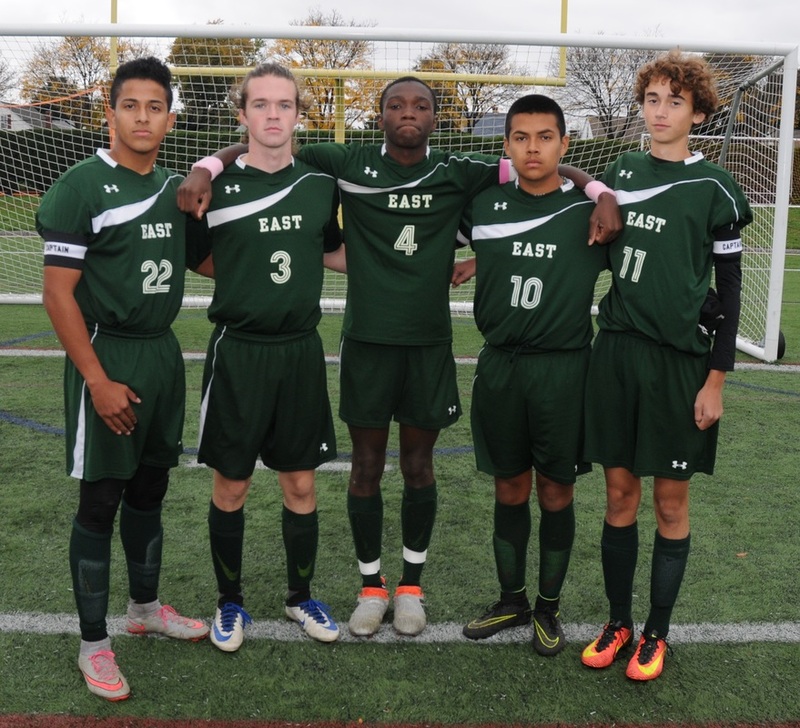 The Cranston East boys’ soccer team didn’t have a goal in 160 minutes of Division III action leading up to Monday’s matchup with Paul Cuffee. Then, it scored 10. The ’Bolts (1-1-1) ran past the overmatched Navigators, 10-1, at Cranston Stadium as junior Richmond Miamen led the way with four goals. Freshman Kerin Murillo also chipped in two goals of his own. East graduated 11 seniors, so this year’s team takes on a much more youthful look. The varsity squad consists of only two seniors, while freshmen and sophomores compose nearly half of the roster. “We did a better job playing the ball to the flag, and that’s what I like to see, the kids spreading out the field,” East head coach Richard Grenier said. “Again, we’re playing against a young opponent, new in our league.” It’s been a slow start for the ’Bolts, tying with Pilgrim 0-0 before coming out on the losing end of a 2-0 decision with Ponaganset. The victory over the Navigators allowed East to open up the playbook a bit, and it boosted the confidence of some of its younger players. The ’Bolts were slow out of the gate, but the scoring didn’t stop once it started. Junior Isaiah Rosa got East on the board first when he collected a loose ball in the ninth minute and placed it in the top left corner. Murillo notched the first of his high school career nine minutes later, sending a shot across the box into the bottom right corner. Miamen took advantage of careless defense on the other end for his first goal. Grenier said Miamen is often double- or triple-teamed, but he was played a little more loose against the Navigators. No one was watching him in the 22nd minute, so he snatched the ball from three Paul Cuffee defenders before scoring on a breakaway. He would tack on his second moments later on an assist from Murillo. The ’Bolts would add another for good measure to close out the half. Angel Lopez took a shot from the left side of the box that was stopped by goalkeeper Juan Gonzalez, but he couldn’t corral the ricochet. Miamen collected it and scored easily to complete his hat trick. “Today, [Miamen] was able to free himself [and] was able to get loose from a young defense,” Grenier said. “He has to have more confidence in his teammates that if he gives up a pass, that he’s going to be on the receiving end. That’s the one thing he has to work on. But one-on-one, he’s got tremendous speed.” Gonzalez was all over the place in net for the Navigators. Despite the outcome, he still made 18 saves before leaving late with an undisclosed injury. East wouldn’t have to endure a second-half slump, either. It came charging out of halftime and added three more in the opening eight minutes. Murillo surged past the defense for another, showing off bursts of speed that the Navigators couldn’t match. Miamen and Mackenley Fevry went back-to-back in a matter of seconds after that. Miamen’s fourth came on a rocket to the center of the net that looked to go right through Gonzalez. On the ensuing kickoff, Fevry was all over the Paul Cuffee defense. He slashed through the line, stealing the ball and potting his first for an 8-0 lead. The game plan was much more conservative for East from that point on, but it still managed to add a couple off the feet of Lopez and Moses Reyes to touch double-digits. Elijah Brown got Paul Cuffee on the board late when he emerged from a scrum in front of the net and put one above goalkeeper Giovanni Canales. “Our first goal is to win a sportsmanship award again, but our second goal is to qualify for the playoffs,” Grenier said. “The playoffs are different now, you have to get 18 points. We have four and we have 12 games. East battles senior-laden Falcons in 1-0 loss! Despite a strong effort in goal by sophomore Gio Canales and a tough defensive, the Bolt lost to the Falcons of Cranston West on a late goal in the second half in the annual City Cup, 1-0. Bolt qualify for playoffs with 2-1 victory! After losing to Johnston, 4-2, the Thunderbolt, one of the youngest teams in Division III, maintained their composure and focus to defeat the Tiverton Tigers on Senior Day, 2-1. With the win, Cranston East finishes 5-5-5 and will host the same Tigers (5-6-4) in the Preliminary Round next week. Freshmen David DaSilva and Kerin Murillo score the two goals on assists from Ayo George and Carlos Montt. ​Advance to Quarter-Finals with 2-1 win! The Thunderbolt of Cranston East continued their season-long roller coaster ride with a thrilling 2-1 victory over the Tigers of Tiverton. With the win, East (8th seed) will face the defending 2016 D-III state champion and 2017 regular season champion, Davies (1st seed). The Green and White, once again, took their cue from two freshmen. Angel Lopez (first half) and Kerin Murillo (second half) were assisted by Richmond Miamen and Carlos Montt. Gio Canales was stellar in goal, posting 15 saves in the win. Clock Strikes Midnight on the Bolts! In the quarter-finals, the team of the present (Davies Vocational) defeated the team of the future (Cranston East) 4-0 to advance to the Division III Semi-Finals for the third consecutive year. Despite a 16 save effort from Giovanni Canales, the Bolt were limited to only 12 shots on goal against the senior-laden Patriots.